My colleagues and I, members of the High Level Committee are delighted to release the Common African Position (CAP) on the Post-2015 development agenda. This document represents the aspirations of the African people and their contribution to the global debate on the formulation of the Post-2015 development agenda. The CAP emanates from the decision of the assembly of heads of state and government of the union of July 2012 (Assembly/AU/Dec. 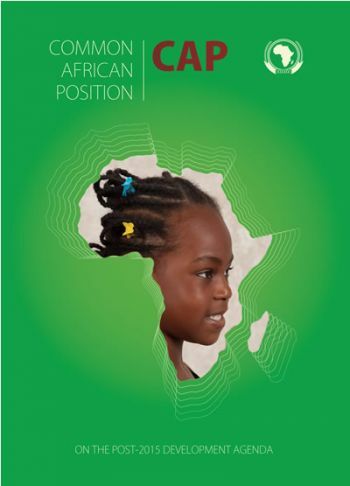 423 (xix)), which mandates the African Union Commission, in close consultation with member states and regional economic communities to identify Africa’s priorities for the post-2015 development agenda. I would like to take this opportunity to thank our fellow colleagues, African heads of state and government, who entrusted us with this historic responsibility to prepare this common position and to coordinate our strategies and actions in building regional and international alliances around the CAP (Assembly/AU/ Dec.475 (xxi). This work was done to ensure that Africa’s priorities are inserted into the global development agenda which will succeed the Millennium Development Goals (MDGs) which expire next year. The process that led to the articulation of the CAP was very participatory and received inputs from a wide spectrum of stakeholders at the national, regional and continental levels among the public and private sectors, parliamentarians and civil society organizations (CSOs), including women and youth associations, and academia. This work would not have been successful without the commitment, dedication and leadership provided by all members of the High Level Committee, namely H.E. Mr. Mohamed Abdel Aziz, President of the Republic of Mauritania and Chairperson of the African Union, H.E. Mr. Abdelaziz Bouteflika, President of Algeria, H.E. Mr. Idriss Deby Itno, President of the Republic of Chad, H.E. Mr. Denis Sassou Nguesso, President of the Republic of Congo, H.E. Mr. Haile Mariam Desalegn, Prime Minister of Ethiopia, H.E. Mr. Alpha Conde, President of Guinea, H.E. Mr. Hifikepunye Pohamba, President of Namibia, H.E. Mr. Navinchandra Ramgoolam, Prime Minister of Mauritius and H.E. Mr. Jacob Zuma, President of the Republic of South Africa. I also would like to express our gratitude to the Secretariat of the High Level Committee at the AUC for its coordination role and the technical support of the New Partnership for Africa’s Development agency (NEPAD), the African Development Bank (ADB), the Economic Commission for Africa (UNECA), the United Nations Development Programme (UNDP), Regional Bureau for Africa, and the United Nations Population Fund (UNFPA) for facilitating the process. We must also recognize the inputs of our diplomats in Addis Ababa, Geneva, New York and Washington, DC who have all contributed to this continental effort. With the launch of the CAP in Ndjamena on the 28th of February, 2014 following its adoption on the 31st of January, 2014 in Addis Ababa, it is now important to engage in a dialogue with the wider United Nations (UN) community including member states, civil society, the private sector and other diverse stakeholders who will be involved in the intergovernmental process of finalizing the Post-2015. We must also work closely with international consultative bodies such as the Open Working Group on Sustainable Development Goals and the Intergovernmental Committee of Experts on Sustainable Development FINANCING . As we engage the rest of the world, it is important that African citizens whose aspirations led to the creation of the CAP fully take ownership of this position and articulate the vision and priorities defined herein. We count on the continuous support of everyone who has contributed to this work and we welcome others who will be called upon to play a crucial role in the negotiation process. Chair of the High Level Committee on the Post-2015 Development Agenda.